Lexy sails again! Now settled in her little houseboat, moored in the slough at the back of the Last Ditch Motel, Lexy Campbell wants nothing more than to build her counseling business, avoid her mother’s phone calls and – who knows? – meet a nice guy. But when she throws a Halloween party for her motley crew of motel pals, the only single man is too old for her, too wrapped around the seventy-two pack chilling in the slough, and – oh, yes – too dead. The smart choice is to leave it up to the cops to ID the body and catch the killer. Lexy and Co. are on the case before you could say “Tam O’Shanter”, delving deep into Cuento’s past for the roots of this present day nightmare. It's no secret that fictional Cuento, CA, is loosely based on actual Davis, CA. Davis Author, Eileen Rendahl. notes that there are a fair few of what she dubbed "Schmavis novels" around. 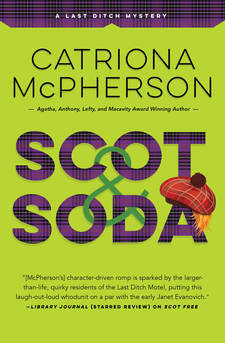 In SCOT AND SODA there are five little Easter eggs that might mean something to readers who know Davis (and won't be any trouble to readers who don't). Just for fun, I've gathered them together here in . . .
1. (Example). The diner in Cuento is called The Red Racoon. The diner in Davis is called The Black Bear. They are both coloured animals. Winner of the 2019 Lefty award for best humorous mystery. A Dru's Book Musings Pick of the Year Book 2018.